Stock product - detailed vector illustration - Poster Vector Collection - Food Truck Menu Street Food Pizza Festival - created by Aurielaki. Image formats EPS AI JPG. 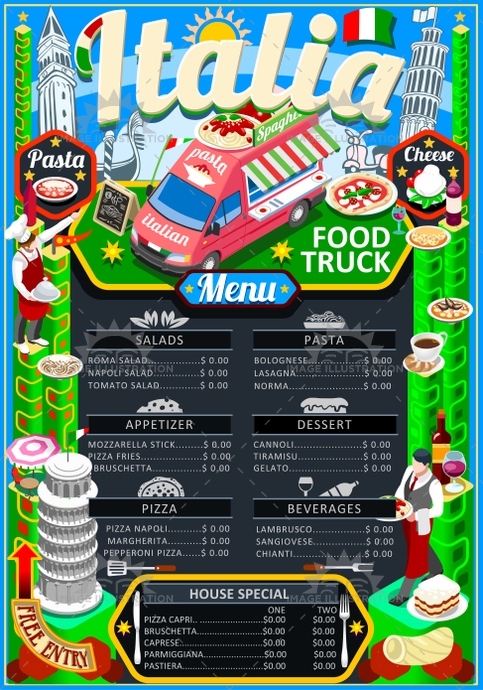 Fast food truck festival Italian pizza or pasta menu brochure street food poster design. Vintage party invite with hand drawn graphic. Vector food menu template for hipster flyer or board. SKU: Food-Truck-Menu-Street-Food-Pizza-Festival-Vector-Poster-AurielAki. Category: Food Truck Menu. Tags: ads, advertise, away, board, brochure, car, card, chef, cooking, cover, creative, delivery, design, doodle, drawing, drawn, eatery, fast, festival, flier, flyer, food, graphic, hand, hipster, icon, illustration, invite, italian, italy, label, layout, leaflet, logo, menu, party, pasta, pizza, placemat, poster, restaurant, retro, street, summer, take, template, truck, van, vector, vintage.